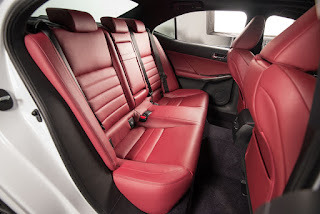 Finally, we get to see the long awaited 2014 Lexus IS at Detroit. As expected, the IS resembles the LF-CC. I am confident that Lexus will do away with the front grille from the debut model so I suppose the production models will look much like the IS250 pictured above. Now from what we know, the 3rd Generation IS shares the same power plants as the current model but a hybrid version will be available this time round for the European and Asian markets. The IS350 F Sport version will now be equipped with the same 8-Speed transmission found in the current ISF. This means quicker shifting times and full torque converter lock-up for manual shifting. 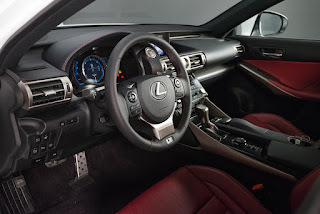 The best part of the deal would be the LFA inspired interior and LCD instrument panel (for F Sport model). Yes, we all know that the LFA is something else but coming back to reality, this is perhaps as close as it gets to owning the already out of production LFA. Furthermore, the new exclusive F Sport red leather interior and dash stitching is simply stunning! Where dimension are concerned, the overall wheelbase has been extended and the legroom increased by 3 inches. That's a great start for I would consider the current IS to be rather claustrophobic in the rear. Put a 6 footer behind the wheel of the current IS and the back seat will only be suitable for Hobbits. We've yet to read any reviews on the ride quality to date but based on the significant chassis and handling improvements seen in the latest GS F Sport, I am sure the IS will be another worthy opponent to its German rivals. Maybe the ISF will be available in 2 door configuration just like the LF-CC. I'm sure Lexus showcased that for a reason? As mentioned in my previous article, Lexus has invested and developed so much technology through the LFA program and it is only obvious that these be made available in their conventional line-ups.